Enjoy photos from the 50th Reunion of the Class of 1968. Please enter through the doors off Senior Circle. (Marriott Hall is the building adjacent to the Lane-Johnston Building.) Beverages and light snacks. This evening is hosted for the Class by the School. (Heavy hors d’oeuvres should obviate the need for a later dinner.) Please enter through the Marriott Hall doors off Senior Circle. The service will be led by Upper School Chaplain Rev. Brooks Hundley. Classmates will be offered an opportunity to read the names of those who have passed and say a few words in their memory. Headmaster Jason Robinson will give welcoming remarks and a School update. 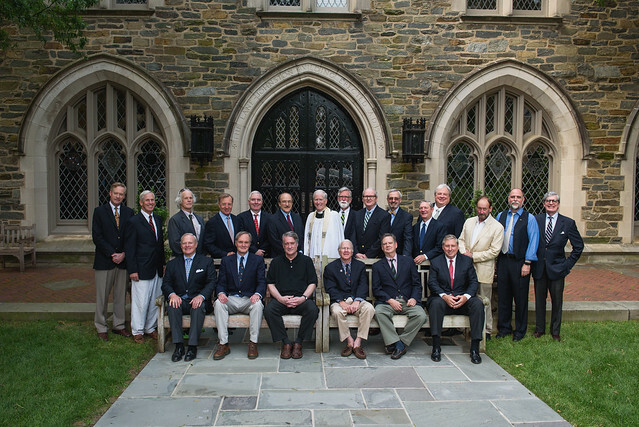 Members of the Class of 1969 will put on their robes in the Cafritz Refectory and an official photo will be taken at the West Front of the Cathedral. Spouses and guests will be escorted to their seats in the Great Choir of the Cathedral. Classmates will process with the Class of 2019 and members of the faculty. Classmates will get together to discuss results of the 1969 survey (sent in advance of the Reunion) and reminisce. Spouses and friends are welcome to visit Open City for refreshment (located adjacent to the Cathedral in the former Heb Cottage). There should be sufficient surface parking on the Cathedral Close, but, if necessary, ample additional space is located in the Cathedral’s underground parking garage. The entrances are located along Woodley Road, at the north side of the Cathedral, and off Wisconsin Avenue (four-hour validation available in the Lane-Johnston building Common Room). A golf cart shuttle will be available for those with mobility/distance issues. Blazers and ties for the Class of 1968 (please, no denim) are appropriate for all events taking place on the Close.